These muffins with their golden, glittery tops will help welcome you into any day. Weekend or weekday, these muffins are for all times. Delicious and simple to make, these muffins need to be in your repertoire. 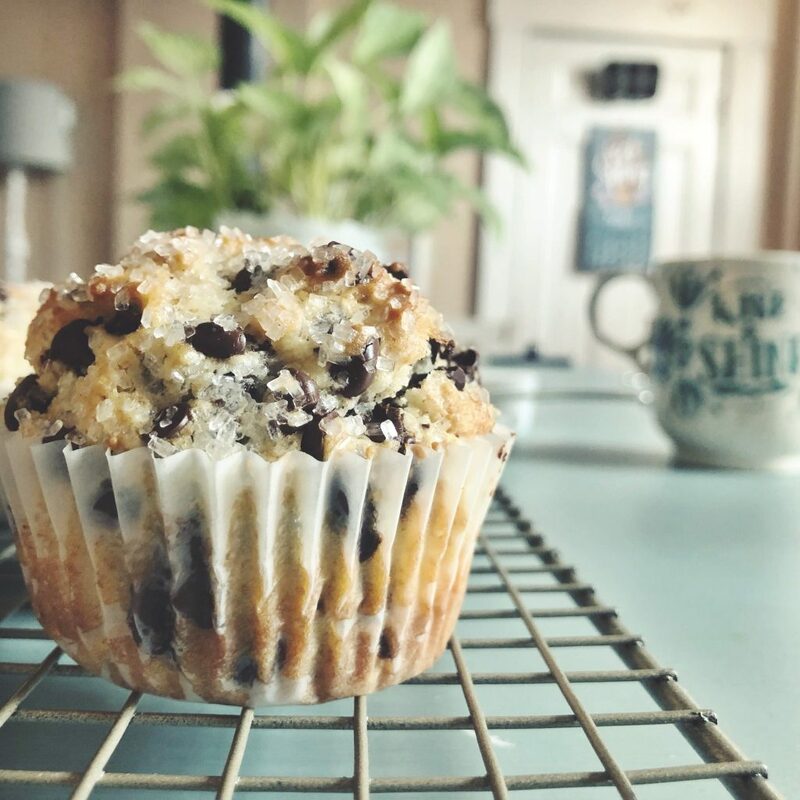 Sally over at Sally’s Baking Addiction has perfected these muffins and does an excellent job of explaining the science behind the bake, it’s worth a read. And these muffins are worth baking! Preheat oven to 425°F. Generously grease a muffin pan with butter or nonstick spray or line with muffin liners. Set aside. Whisk the flour, baking powder, salt, cinnamon, and nutmeg together in a large bowl. Set aside. Whisk the eggs, sour cream, and sugar together until combined. Then whisk in the milk, oil, melted butter, and vanilla extract. Mixture will be pale yellow. Fold wet ingredients into dry ingredients and mix together gently. Avoid overmixing. The batter will be thick and somewhat lumpy. Fold in the chocolate chips. Divide batter among prepared muffin pan, filling all the way to the top. Sprinkle with coarse sugar (for added crunch, recommended! ), if desired. Bake at 425°F for 5 minutes, then, keeping the muffins in the oven, reduce the oven temperature to 350°F and continue to bake for 25-26 minutes until the tops are lightly golden brown and centers are set. Use a toothpick to test. Allow to cool for 10 minutes in pan before removing and serving. Cover leftover muffins and store at room temperature for 5 days or in the refrigerator for 1 week. Muffins freeze well for up to 3 months. Thaw in the refrigerator or on the counter. I’ve made these with and without the sour cream–the sour cream does make the muffins moister. I also use buttermilk in this recipe and prefer for my preference to leave the cinnamon and nutmeg out when it comes to chocolate. I also used mini chocolate chips, I like how they evenly distribute chocolate in every bite! Sour Cream/Yogurt: This recipe has been updated to include a little sour cream or yogurt for extra moisture and tenderness. You can leave it out if desired, but the muffins are FANTASTIC with it! Milk: Using buttermilk in this recipe makes the muffins extra moist. You can use any milk, dairy or nondairy, but the lower fat milk you use, the drier the muffins may taste. Oil: Vegetable oil, canola oil, or melted coconut oil work best in this recipe. Butter: Small update to this recipe: add a little melted butter with the oil. Yields a buttery delicious muffin! You can leave the butter out, but make sure you increase the oil to 1/2 cup. Chocolate Chips: You can use a mix of regular size and mini size chocolate chips for varying chocolate texture. You can also use chocolate chunks or milk chocolate chips. 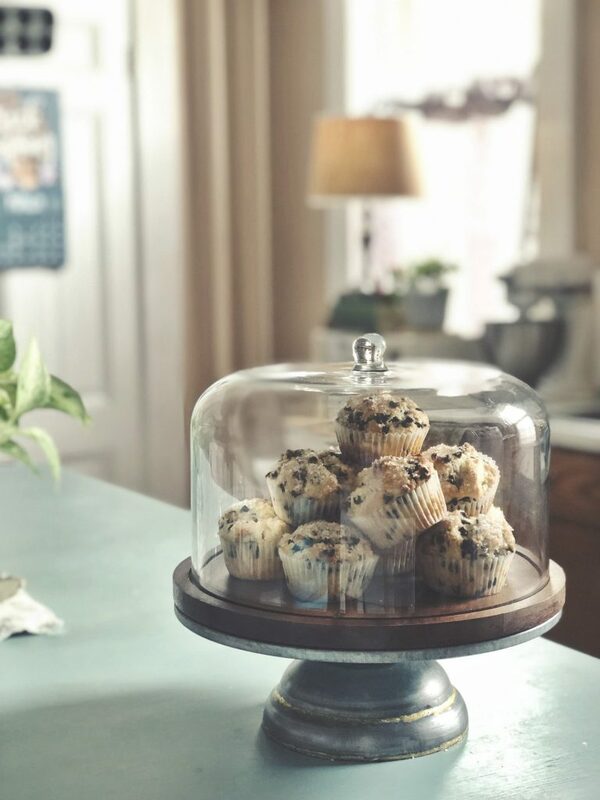 Standard Size Muffins or Mini Muffins: For 15-16 standard size muffins, reduce baking time to 18-19 total minutes: 5 initial minutes at 425°F and 13-14 minutes at 350°F. For about 50 mini muffins, bake for 11-12 minutes at 350°F the entire time.